Make these colorful holiday Gift displays entirely from boards salvaged from old shipping pallets! Using wood from recycled pallets just makes sense...not only do you save money making these attractive displays but you also help the environment by saving trees and keeping used pallets out of landfills. Full-size pattern and instructions are included to make our Layered Vertical and our Horizontal Gift Trios, both with layered wooden bows. 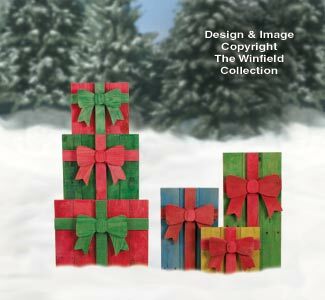 The techniques presented can also be used to make Pallet Wood Gifts of many different sizes. Painting details are also included that will allow the rustic texture of the recycled boards to show through. NOTE: Pine boards or low-cost fence boards can also be used to make this fun project in lieu of salvaged pallet boards.